After much consideration, I decided that the one thing missing from this blog was merchandise: some way for the Copyeditor General's legions of supporters to demonstrate their love of good grammar. So I started checking out online custom merchmongers to see what was available. But I only got as far as Spreadshirt. And then I had to stop. Because I was reminded of what's really important. Um, what? Eisenhower was many things, but fashion designer was not one of his best-known traits. 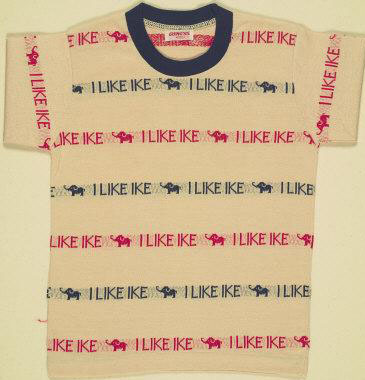 And while there is at least one example of a kid-size campaign shirt, I highly doubt that Ike's win over Adlai Stevenson in 1952 (not '53, Spreadshirt fact-checkers!) came down to little Billy's decision to wear it to the fishin' hole. "Spreadshirt makes it possible for private and commercial internet site operators to market their homepages quickly, simply, and independently. Internet site operators can create an online shop with individually created products and connect it with their homepage within minutes." Internet site operators? When was this written, 1996? And why are we only marketing the homepage? What are all the other pages on my site, electronic chopped liver? "To operate a Spreadshirt shop, you just need Internet access, your own designs or logo, and to market your shop online." Don't you love how easy it all sounds? Yep, just log on and use your in-depth knowledge of online marketing! Weren't we all born with that? Okay, pop quiz: when you think about successful internet businesses, what names come to mind? Google, eBay, DoubleClick? Nay, I say thee! Nay! "Spreadshirt is one of the most successful internet companies of the past few years." Two hundred and fifty employees, they have! Look out, Yahoo! "We want to build the best possible online create-buy-experience for everyone from Homer Simpson to Salvador Dalí." Well, good luck with that. I hate to break it to you, Spreadshirt, but one is a cartoon character and the other left us in 1989. Neither will be ordering from you in the foreseeable future. "We want to be a fun and inspiring place to work, where integrity, delivery, and innovation reigns." Which one? If they all reign, they need a plural verb, dears. "There is no limit to what your imigination can do." True: there is no limit to what we can imigine. Copyeditor General's ruling: I have nothing against Germans. Seriously, I don't: I studied the language for five years. I love their Riesling, their Stollen and the fact that The Hoff has somewhere else to go. But the same goes for them as for the Japanese, Peruvian-Canadians, Texans and Steven Seagal: when your website is the face of your business, you need to make sure your content is flawless. If you're wrong about easily verifiable facts, and you don't check spelling, how well will you do with my order? Olympians will try to win. Period. I can't watch the Olympics. I just can't. Sure, I love the running around and the jumping and the splashing. But whenever the announcers start to discuss the essential aim of the participants' actions, I have to turn away. Because eventually they'll use That Verb. One could clearly make a case for the verb's legitimacy. There's even a linguistic term that describes this kind of thing: anthimeria, or the use of one type of word as if it were another (e.g. a noun used as a verb). Shakespeare and Milton did it all the time. I should make clear that it's not the practice of word-use substitution that bugs me: it's purely, simply, exquisitely That Verb. It's unnecessary. It's vapid. Again, it's lazy. And yes, it takes longer to say "he'd like to finish within the top three" or "she hopes to win either gold, silver or bronze" or "he expects to be one of the guys with the flowers and the crying and the national anthem and stuff." I wonder, though, whether there's a more culturally telling reason for the use and acceptance of this particular word choice: it makes the goal of the action the verb. It turns the symbol of achievement into the entire experience; it makes the destination the journey. It's no longer about participation: it's about winning, period. And don't even get me started on the use of "winningest." Copyeditor General's ruling: If this is an acceptable way of referring to aspirations and aquisitions, why limit it to sport? Why not use it in other circumstances? I haven't had lunch yet, but I expect to sandwich soon. Our offer was accepted, so it looks like we'll house by the end of the month. She went into premature labor and surprised everyone by babying this morning. Both McCain and Obama are hoping to president in November. Okay, your turn: hit me with your best/worst example of anthimeria! Last week we went to the New England Aquarium, whose main attraction is the four-story tropical ocean tank, in which swim turtles, sharks, sting rays and all manner of brightly colored fish. Handsome fella, no? 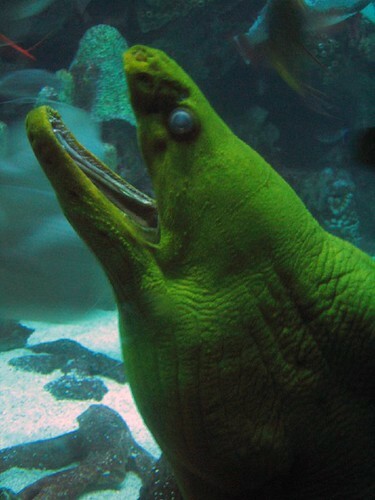 He's a moray, and there are two, or maybe three, in the tank. I'm not quite sure of the exact number because we never saw them together; they seemed to be solitary creatures. All of which lead me to believe that the morays we saw were just spending a little alone time before getting together for a rousing game of bridge. Copyeditor General's ruling: Another case of those darned confusing homophones, which we've covered here before. My instinct is to blame the blessing/curse of the Internets, where anyone can post anything without going through an editorial gatekeeper. But not this time. All the above came from books. Actual, real, printed (and allegedly edited and proofread) books. You can see a few dozen more examples here. Shocking!